Add “Thank you, Clarence Thomas!” to the list of things you never expected to say. 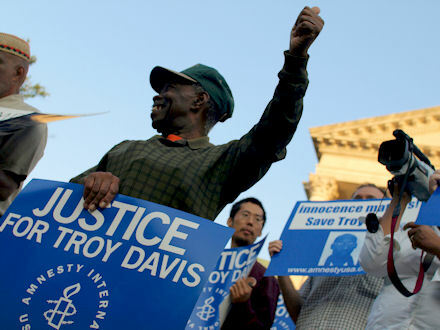 Just an hour and a half before Troy Davis was scheduled to be killed for a murder he did not commit, the United States Supreme Court issued a one week stay of execution. Little more than one year ago, mounting pressure forced the Georgia Board of Pardons to halt a previous execution date. 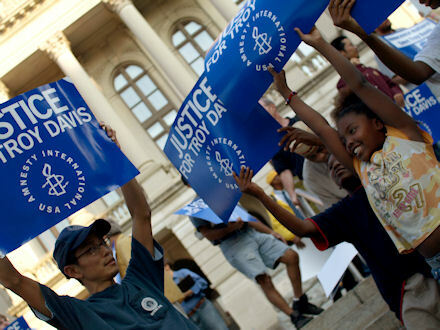 Since then, awareness of the State’s flimsy case against Davis – lack of any physical evidence, recanted or factually incorrect testimony from witnesses – has reached national and international prominence. An attempt at lynch-mob Georgia justice has grown into an embarrassment for the United States. 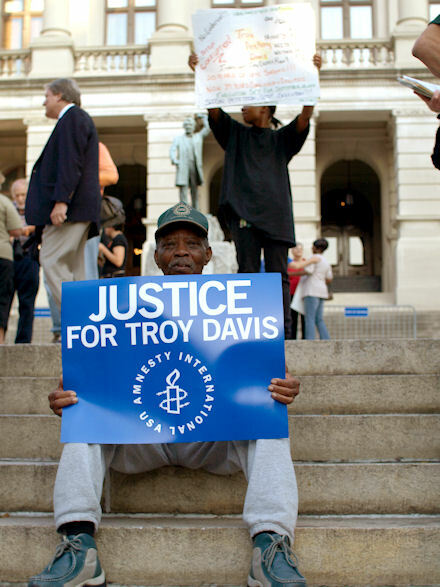 Chatham County Judge Penny Haas Freeman decided that she would sign and execution warrant against Troy that would be effective before the US Supreme Court even came back into session. Give me a few boos! The US Supreme Court has been on recess and they come back on Monday. We didn’t think we would be fighting in September like we have been fighting. But what the US Supreme Court has said is: “You know what? Let’s create a delay. When we get back to work on Monday, we will look at that petition and decide whether we are going to take it. They’re not going to decide whether to grant him a new trial or an evidentiary hearing on Monday. They’re simply going to decide whether they want to consider doing that. So this struggle is not over. And you need to continue to tell your friends and families to add to their name and their voice to this cause. But we at least have a little more time, Troy has a little more time to spend with his family and loved ones, to celebrate life, and we should all treasure life. Every day is a gift. So I just want to thank you again. We will celebrate today, we will organize tomorrow! Watch this blog for updates over the next week. 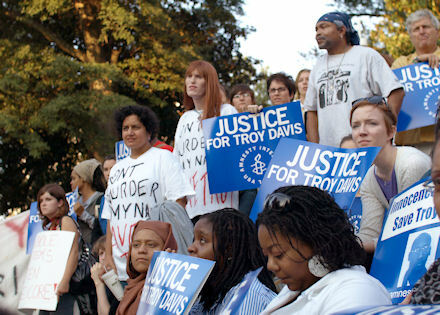 The facts of Troy’s innocence have been clear for nearly two decades, so why did it take up until this evening to give him one more week? I have not been deeply involved with death penalty abolition work, but from following some of the main cases it seems like the stays of execution are always handed down when things are down to the wire. This seems to be a way for the state to simultaneously “give” to pressure from below while maintaining as much authority as possible. For example, although I began this update with a sarcastic appreciation of Clarence Thomas (who supposedly initiated the action of the Court), some people at the rally were more forcefully expressing gratitude. The Courts assume a Godlike power to determine life and death. At moments like these, as we continue to organize, it is vitally important to recognize and explain that they were forced to respond to pressure from below. If Troy’s life is saved, it will be through the hard work of his family and many friends who have tirelessly worked, not the enlightenment of government officials. It may be temporary euphoria of today’s emotional rollercoaster, but I am optimistic. The intervention of federal government demonstrates that this case has escaped the internal politics of the US and become a matter of international importance. On that stage, the US has been proven vulnerable to embarassment around its hypocritical neglect for human rights. In a high-profile case like this, it seems like they have more to lose than to gain by killing an innocent man. The task is to continue to make it more high profile. Over the next week, please visit http://amnestyusa.org/troy to keep up with the ongoing struggle.